The boys decide to rescue the girl themselves, with guns and money taken from the studio’s prop department. However, once the crooks realize that the Stooges aren’t really armed, the chase is on! While Moe and Larry decoy the crooks, Shemp takes the girl’s place in the closet (zipped up in a garment bag to boot) to give her a chance to escape. She does so, and Larry finds the police in a nearby room playing cards. Larry has a brilliant idea, and throws pastry at the cops, having them chase him as he leads the police to the kidnappers. In the meantime, Shemp has walked out of the closet onto the window ledge. After the crooks are captured, Shemp seemingly falls to his death. But instead, he hangs outside of the hotel, suspended by a telephone cable, and finally “dropping in” on another hotel guest. This entire routine is a tribute to Buster Keaton’s So You Won’t Squawk. Moe (Moe Howard): Do I look like a termite? [pause] Don’t answer that! Shemp (Shemp Howard): Aw, that’s too bad, are you peeling? 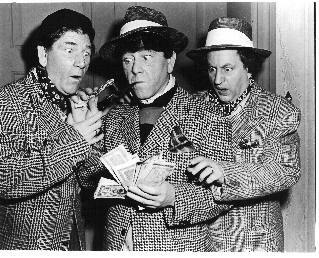 Shemp (Shemp Howard): Keep your chin up; mine are down to my knees. Moe (Moe Howard): Careful with that! Where’d you get it, anyway? Larry (Larry Fine): The same place I got the money … from the studio. There was a room there marked “Property”, but it didn’t say whose. Moe (Moe Howard): Well, finders keepers. Gangster [To Shemp]: Who are you? Shemp [grabbing sand from an ashtray and throwing it in his eyes]: I’m the sandman! Christine McIntyre: What did he say? Moe (Moe Howard): Poor Shemp! Larry (Larry Fine): And he had his good suit on, too. Moe (Moe Howard): Keep a stiff upper plate, kid! Moe: You get a rope that’ll reach to the 10th floor and step on it. Larry: Hey, you better bolt that door in case our adversaries come back. Moe: Since when did you get so smart? Larry: Oh, I’ve been smart all the time, only you didn’t know it. Say, when I come back, I’ll give you the password. Moe: Brilliant! What’ll it be? Larry: [Whispering] Open the door.